During the first decades of the Qing dynasty which was foremost established around the capital Beijing, in the North, not much if any porcelain was made for the court since the porcelain factory was located in the far from completely subdued South. This early period is therefore called the "transitional period" during which some remarkable good quality pieces was made for local businessmen, scholars and mandarins and for the export trade to Europe via the Dutch East India Company (VOC). The Qing Dynasty (1644-1911) which followed immediately after the Ming, is by many seen as the most successful of all the Chinese dynasties during the last two millennia. If we look at the period ruled by the three early emperors, Kangxi, Yongzheng and Qianlong this might be true but the disastrous ending from the mid 19th century and onwards indeed takes away some of the luster. The Qing dynasty was founded by the Aisin Gioro family of the Manchus. The Dynasty was begun earlier then that, in 1616, by Aixinjueluo Nuerhachi under the reign name of Tianming. The reign names (nianhao) are different from the personal name of the emperor and it is this reign name we find on the bases of the Imperial porcelains of the period, not the name of the Emperor himself which we rarely don't even keep track of. To get on with the story, his son Aixinjueluo Huang-tai-ji used two different reign names during his reign, Tiancong (1627-1636) and Chongde (1636-43). From the Shunzhi period and onwards only the reign names are used when referring to the periods. During the last period Aixinjueluo Puyi actually ascended the throne in 1908 while the "Xuantong" reign is counted as started 1909. During the latter part of the Qing dynasty the Empress Dowager Cixi (Born 1835), who became dowager on the death of her husband, Xianfeng, in 1861, exerted a considerable influence on the Late Qing court until she died in 1908. Despite that the Chinese capital Beijing had fallen into the hands of the Manchus, southern China was not completely under Manchu control before 1683. The resistance continued under a number of Ming dynasty princes and because of the strong loyalty towards the Ming, the Qing court were not able to order any "Imperial" porcelain from Jingdezhen in the southern Jiangxi province before about 1683. This early period is therefore called the "transitional period" during which some remarkable good quality pieces was made for Scholars and Mandarins, and some for export to Japan and Europe via the Dutch East India Company (VOC). The best defines a period called high transition and some pieces from this period features very artistically applied washes of underglaze blue and some even the very difficult underglaze red made from copper oxide. The decorations show a spontaneous, naturalistic style, the subjects often taken from book illustrations and prints. A vertical cloud often occurs as a divider in the decoration. Borders of thin lines incised near the top and foot rims and a clear blue color on a very white paste are characteristic features. Export porcelains intended for the Japanese market makes up another characteristic group during this period and are often of very special designs. Unglazed bases is a typical feature of this period but is no rule. High quality Transitional / Early Kangxi game markers jar. "Dragoneer Jar" from the collection of August the Strong of Saxony. Imperial pieces and Export porcelain of extremely high quality, both in paste and the blue pigments. 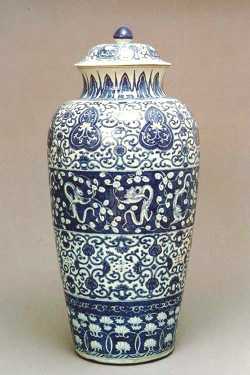 Kangxi blue and white porcelains reached the peak of perfection in the late 17th and early 18th centuries. The earlier "Transitional Period" designs gradually evolved into classic styles as kilns once again came under Imperial control. Foot rings are carefully treated and mostly seems to be polished or rounded off before glazing. Ascending the throne at the age of 45 he was as his grandfather a devout Zen Buddhist and turned out to be an able ruler. The new Emperor took an interest in the imperial porcelain factory, and some of the finest porcelain ever made was produced during his reign. In 1726 the Yongzheng emperor appointed Nian Xiyao as administrator of Jingdezhen, who also personally supervised the manufacture of the porcelain destined for the Imperial Court. The porcelain is very delicate and often in the style of the Ming emperor Chenghua. After 1730 a marked decrease in the production of blue and white wares could be noticed due to the rising popularity of polychrome enamels. A "Qing" style is emerging, which could at best be described as "Flowery". Widely different, stretching the limits of what was possibly to make. Imitating everything previously done and all kinds of materials (not in blue and white, though but in enamels - imitating wood, bronze, anything.) Skilled craftsmen produced magnificent copies of earlier masterpieces. Overall floral scroll designs characterize the wares of this reign. The paste is dead white. 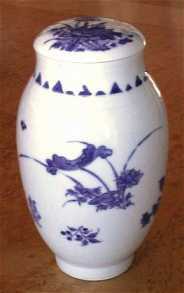 Chinese porcelain is now becoming a standard article in wide use in Europe. Huge amounts of dinnerware (dishes, soup tureens, huge flats dishes, salad bowls, etc.) are exported to Europe in shapes and with decorations designed in Europe, often in a "Chinese" style - called Chinoiserie. By the end of the 18th century and the beginning of the 19th century porcelain is becoming less expensive to make in Europe than in China. Transfer printing has been introduced in Europe of porcelain designs which makes it very difficult nigh impossibly to compete, for the Chinese who are hand painting everything. Export to Europe decreases. Foot rims are generally coarse and unglazed, although a more delicate foot ring occurs on fine pieces. The 19th century is traditionally regarded as a down period for Chinese porcelain but exceptions occurs. When North America began sending ships of its own to trade with China in the early 1800s, they entered into a business that since long had found its form. A limited number of standard patterns made up the majority of the Chinese porcelain wares that was exported at this time. The main market was North America, during the full length of the 19th century. Popular patterns includes a blue and white "willow pattern" called "Nanking" with pagodas in a river landscape and an enamel pattern with mostly green flowers end mandarins within panels, called Rose Medallion. First class Imperial porcelain is developed in classical Chinese taste. It is nowadays getting better known and finally receiving its well-deserved admiration. During the middle and later part of the 18th century China is torn by famines, war and general unrest which problems naturally also causes problems for the porcelain industry. 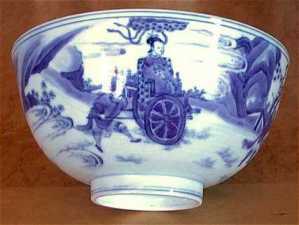 Blue and white decorated porcelain becomes comparatively uncommon during the 19th century, maybe because of the fighting that hits also Jingdezhen and its kilns in 1853. Production was curtailed and the Imperial factory were not rebuilt until 1864. On the whole not much porcelain appears to have been made at all during the third quarter of the 19th century. Increased wealth, immigration and improved world trade involving South East Asia and far away markets such as North America improves Chinese economy and from early Guangxu period Jingdezhen appears to try to make up for lost business. Enameled designs on late 19th century and early 20th century pieces for the common men are often carelessly executed however the Imperial kiln and their subcontractors appears as skilled as ever. From the end of the 19th century an artistic, scholarly style of decoration appears in muted enamels, inspired by traditional silk paintings, called qian jiang. The Imperial court under the Empress Dowager Cixi introduces a new decorative style incorporating very large flowers. A common export decoration from the Guangxu (1875-1908) period and later occurs in imitating crackled Ge glaze, warrior type figures and with a ring etched in brown around the base or the shoulder. The bases usually displays a roughly incised reign mark, etched on a brown square. As late as 1920 a visitor to Jingdezhen reports that the largest export customer of porcelain is a North American company. The 20th century witnessed as dramatic events as any previous reign and what porcelain that was made was as diverse as ever. In 1911 the revolution led by Dr. Sun Yat-sen ended the rule of the Qing Dynasty. The Imperial family rule that had existed in China for 2,000 years came to an end, and the provisional government of the Republic of China was founded. During this period a last attempt to establish a new dynasty led to a temporary revival of the potters art when substantial funds was spent of developing a new Imperial ware for Yuan Shikai under the name of Hongxian (1915-16). The Song dynasty was first considered as the best model for the porcelains of the new era, why very likely some incredibly good copies of the Song classical (Ge, Guan, Ru, Ding and Jun) wares date from this period. It was finally decided that the porcelain of theYongzheng period would suit as the best model, why also some very good early Qing style enameled wares dates to this period. Regarding the genuine pieces that was actually made during this period, I personally feel that is seen from a set of entirely new shapes that distinguish the real Imperial porcelain from this short period from the much debated similar pieces that carries the marks of the period. In 1937-45 Japan occupied a large part of China which was followed by a war of resistance against Japan. This was a troubled period for the Chinese people which naturally affected the ceramic industry. From pieces that would fit to this period one can recognize attempts to start up a more industrial mass production. Experiments with using coal for firing porcelain is made. Some cooperation between Chinese and Japanese potteries also seems to have occurred. In 1949 the People's Republic of China was founded, with Mao Zedong as chairman of the Central People's Government after which a much needed recovery period takes place between 1950 to 1956. The modern ceramic production could be said to have started by 1949 by the introduction of more efficient kilns fired by crude oil and transfer printed overglaze decoration. I believe lots of influences reached China from Russia during this time. Some heavily over decorated and bombastic pieces dates to this period. Between 1956 to 1966 heavy investments were made in new and basic industries. Mass production and better control gives higher quality. Very few attempts are made to artistically vitalize the production that still runs in old tracks however technically very impressive pieces are made for official presentations. The disastrous "cultural revolution," lasted for ten years from May 1966 to October 1976. Most activities on all levels was halted and nothing much was produced. In 1978 China instituted a policy of reform and opening to the outside world with the focus to modernization centered around the economy "with Chinese characteristics". The ceramic production could from now on be considered very modern with artistic and mass production side by side. See also my article "A Visit to Jingdezhen" on this. What books to recommend for Chinese Porcelain of the Qing Dynasty depends if you want to study the best that could be made (Imperial), what was made and exported to the West (Export Porcelain) or the popular wares that was made for export to the poorest of farmers and the working class all over Asia in particular from mid 19th century and later. All is technically "Chinese porcelain" and most was in fact made in Jingdezhen. But there and then stops the similarities. A reliable and traditional classic is Soame Jenyns, Later Chinese Porcelain for the "good" Chinese taste pieces. For export porcelain Jean McClure Mudge, Chinese Export Porcelain in North America or Geoffery A Godden, Oriental Export Market Porcelain and its influence on European Wares might be good starting points. They won't hurt to have anyway. For the best of the best, search for anything with "David Howard" as the or at least among the authors. Finally the best overall book there is on Chinese ceramics is in my view He Li, Chinese Ceramics which covers everything, including the Qing Dynasty. That is a good one too that you will never regret buying. As a general rule, you should spend at least 10 percent out of the amount you plan to spend on porcelain, on books. And ideally you should always buy the books first. After ten years, please send me the amount of money you feel you have saved by following this one advice and I'll become a rich man.